I know its not in great condition and the pot is way to small (im going to re pot it) but shouldn't it produce them anyway? Ive had this plant for 2 years and haven't gotten a sing pup. Is it simply because it needs a bigger pot? Would it be possible for you to post a picture of your plant? The plant doesn't look unhealthy ... just has a couple of broken leaves. If you like, you can cut them off at the stem, using a clean, sharp knife, but the plant is fine as it is. I can't tell for certain which variety your aloe is, but it looks like it might be the darker green variety, which is not nearly as prolific at producing pups as the lighter green/variegated/speckled type. You should still get some pups, though. It's very possible that your plant just isn't old enough yet to produce pups. Aloes, like cacti, usually produce more pups when they are slightly root bound. If you repot your plant, be careful not to put it in too large of a container. Although aloes are adaptive to a wide range of conditions, they do best in a potting mix designed for cacti and succulents. They can survive in low light conditions, but they prefer a lot of sun. During the winter months, you might want to consider using grow lights to increase the light intensity for your plant. You can move your plant outdoors in the summer, but don't put it into direct sunlight right away. Start it in shade, then every couple of days, slightly increase the amount of sunlight it gets. 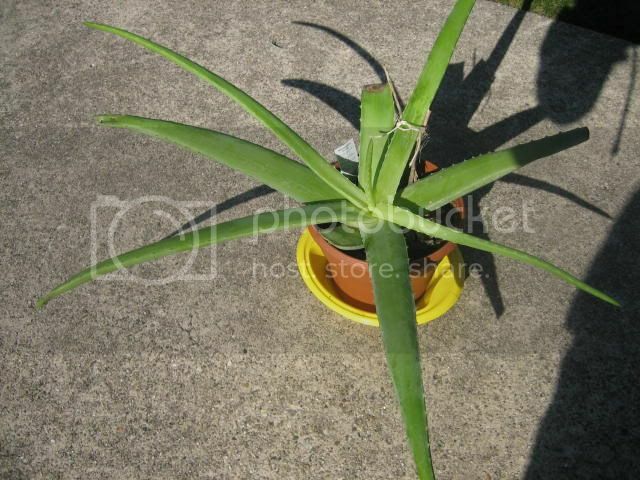 I really want to know when aloe vera plant can produce pups i mean .. what age? @Nanoc, how long have you had it? I've had mine for a long time now and it has produced multitude of pups, and the pups have produced pups. The one I have might not be the same species, but it seems to me mine grows pups whenever I neglect it too much, let it dry out, then water it in a panic. Not much of an answer, I know. I keep mine inside by the SE window/on the windowsill year-round since I sunburned it terribly when I tried to put it outside one year. It gets very cold by the window during winter here, freezing enough that there is frost/ice on the inside window when coldest, but it doesn't seem to mind. I do have to watch out for scale insects that ants coming in along the window frame bring to pasture on my Indoor plants. let them dry to the point you think they just might not make it then transplant into a mix of rich compost and sand, 50/50. the container should be just slightly larger than the root mass.. water in once really well and stick it in a bright location. give it 1-4 cup of water per gallon of soil per month. if its an outdoor direct sunlight plant then it needs more water, a sunny window or indirect outdoor location it doesn't need as much. the more sun it gets the more water it needs, but never needs a lot of water. I have kept them alive in yougurt cups for a whole year indoors with just an initial soaking (not happy but alive). the ones that spread do so when in shallow containers and just a little water per week. water around the outside of the root ball to make them seek it out. if you water right at the base of the main plant, it wont have any reason to try to spread. I have it for 5 months and i think it was more than 5 months old when i bought it ,so now it's more than 10 months. But how can i do so ? I grow it in a container so mine needs 1 liter of water to be fully watered and then i leave it until it's fully dry, so when i pour this amout of water the surface of the plant is covered with water for 3-4 mins. Until the plant absorbs all of it. How can i water around the outside of root ball in this case? My aloe didn't start producing pups until after about 4 years. In that time, I nearly killed it twice (overwatering while it was indoors), and each time pruned off the "sick" leaves and reburied the entire trunk. I've been in my apartment for two years now, and it is outside on my patio...the "root" is rather long after the two prunings. Last summer, it produced twins. I just checked it this morning, and another pup is emerging from the dirt. Don't know yet if that is the only one...will have to wait and see. I have to thin my aloe patch at least twice a year. Where I have cut them off, they just sucker and grow more. Mine is very old. It is probably 30-40 years old. I moved an old Aloe plant from a bright east window to a very bright south window. No direct sun but super bright. I water slightly every two weeks. Pups emerged within a month and haven’t stoped. I now have 4 clumps of pups. Anectodal but there you are. HELP!My Aloe vera pups are dying! How to transplant Aloe Vera pups?